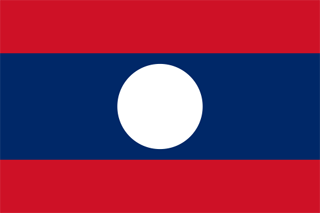 The Laos flag was officially adopted on December 2, 1975. The white circle on the blue field is said to represent the moon shining over the Mekong River. The blue stripe represents wealth, and the red represents the blood shed during the internal struggle for freedom. 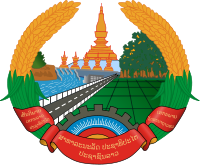 Adopted in 1992, the emblem of Laos depicts the national shrine Pha That Luang flanked by stalks of rice. The two inscriptions on the bottom, in Lao script, read: "Peace, independence, democracy, unity and prosperity." Where is Lao People's Democratic Republic? What is the Capital of Lao People's Democratic Republic? What Type Of Government Does Laos Have? What Languages Are Spoken In Laos?